6 May 2014: A mother is a friend, guide, sister and wife. But most importantly, she is a woman of substance. She brings in happiness, eases worries and resolves conflicts. With so many super powers, why would mothers not be called super moms? To indulge in the joy of gifting, Titan presents two lovingly selected watches from Raga and Purple. Celebrating their presence in our lives on a day in their honour, Mother’s Day is the perfect opportunity show her how much she means to you. This Mother’s Day, gift your mother a truly special token of love that she will cherish forever. Perola from Raga is an exquisite traditional watch, set with 22 uncut pearls along its bracelet. Each framed pearl along the bracelet is set in a free fall link, so the watch falls along the contours of the wrist. The Mother of Pearl dial is tinged with hues of green and has precious crystals set on every quarter of the hour. The watch is available in white and black pearls. The dual toned contemporary watch from Purple is studded with 36 Swarovski baguette stones on the bezel. The rose-gold toned Mother of Pearl dial has basic chronographic settings. The bold dial is accentuated by its silver and rose-gold link straps. 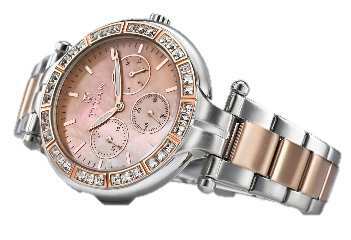 The watch has multi-function movement and a case size of 38.5 mm. Titan watches are available at World of Titan stores, Helios, Lifestyle, Central, Shoppers Stop and select authorized dealers.